Shimmo is a little more than 2 1/2 miles east of and directly across the harbor from Nantucket town. Its location affords beautiful views of Coatue's barrier beach and wildlife refuge just across the water as well as Nantucket town and harbor. Residents of this area enjoy a special privacy and setting. 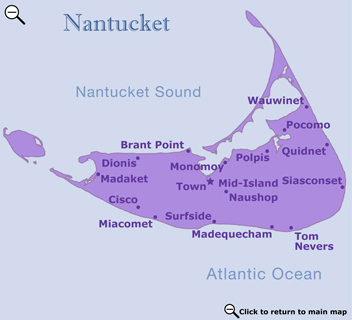 Monomoy is situated a little closer to town than Shimmo. It is a lovely area set on a quiet corner of Nantucket Harbor. From Monomoy's waterfront, you have beautiful views of downtown and the harbor. Monomoy is within walking distance of the well known rotary (only one on the island) with a grocery store, hardware store, restaurants, and retail stores.